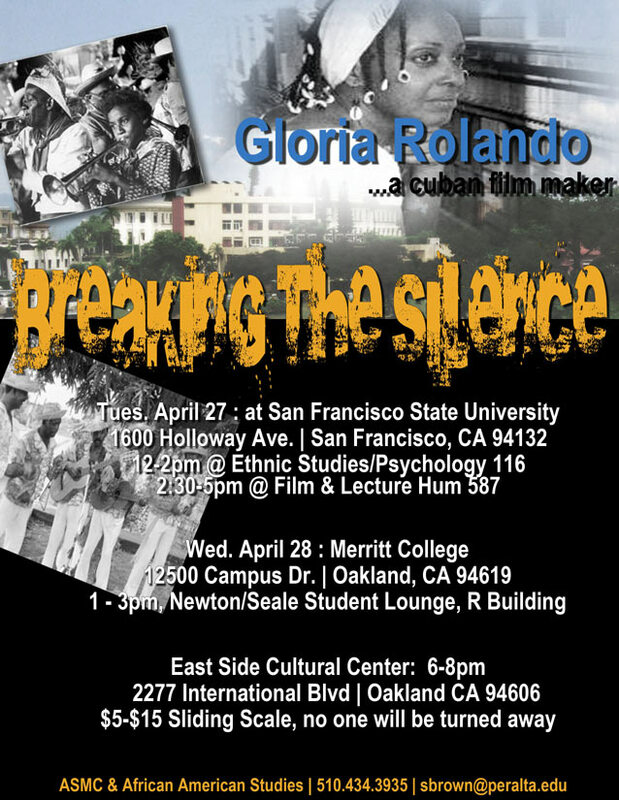 Gloria Rolando is a filmmaker who has been up to the US on a number of occasions to give presentations about her work on AfroCuban culture at universities and community centers. A Gloria Rolando tour is taking place in April of 2010, she has already arrived in the US. Below we have Gloria's suggestions for presentation topics - she has been intensively studying the Party of the Independents of Color and their Massacre in 1912. She has recently made several trips to Oriente under difficult conditions in order to gather a rich set of materials for a series of documentaries around these topics, which have long been neglected in Cuban history. She has been working with authors and historians, especially in Oriente where there are untapped reservoirs of knowledge about 1912, some of which are referenced on our 1912 Massacre page. It is one of Gloria's goals to raise the visibility of these researchers. This documentary work follows her feature film Roots of My Heart, which deals with the theme of a young AfroCuban woman's discovery of her ancestors' participation in the events of 1912 and the death of her grandfather in the Massacre. She has completed the first chapter in this series, "1912, Breaking the Silence" This 47 minute documentary deals with why the creation of the PIC was necessary and her crew has created the English subtitles. She will have a copy of this film with her on her 2010 tour - it was recently premiered in Havana. She will have all of her films with her, as detailed on her page, so as to be able to show them. We will be updating this page with news of her tour. Those interested can contact the tour management. The video group Images of the Caribbean proposes the following agenda: talking in pictures about the Party of the Independents of Color. Two lectures, two presentations, two approaches to the issue of the Party of the Independents of Color in the context of the 100 years since the founding of the Party in1908 and the 100 years since the Massacre of 1912. Presentation of 1) Roots of my Heart (feature film, 51 min) and 2) the first chapter in the documentary series on 1912 (1912, Breaking the Silence; why was the creation of the PIC necessary?). Note: Gloria will have copies of all her films with her in case there is a need to show and discuss them. El grupo de video Imagenes del Caribe propone el siguiente programa: hablando en imagenes sobre el Partido de los Independientes de Color. Dos charlas, dos presentaciones, dos enfoques del tema del Partido de los Independientes de Color en el marco de los 100 anos de la fundacion del Partido (1908) y los 100 anos de la Masacre de 1912. Presentacion de las Raices de mi Corazon (ficcion, 51 min) y del primer capitulo del proyecto documental 1912 (Historias de la poblacion afrocubana en la lucha por la independencia nacional en 1912, Voces para un Silencio; por que fue necesaria la creacion del PIC?). Nota: Gloria tendra una copia de todas sus peliculas en caso de necesidad. Friday, April 9th from 4 p.m. to 6 p.m. The viewing of the film will be followed by a question and answer period and reception. Sponsored by the MU Afro-Romance Institute, the Ragtag Cinema, and the Sonya Haynes Stone Center at the University of North Carolina-Chapel Hill. Today we had Gloria's screening. We had a full house with administrators, faculty, students, and people of the community, even standing up and seating on the floor. It was an absolute success to the point that a lot of people asked her to come back. Gloria is ready to go on this wonderful tour. Thank you Joseph for facilitating Gloria's tour! *(Cherished Island Memories) Pasajes del Corazon y la Memoria* is a short history of Cubans and Cayman Islanders in The Isle of Youth, Cuba. In mixed Spanish and English with subtitles. 37 minutes. A subsequent screening of her newest film *1912:Breaking the Silence* will be offered on April 12th at 1:30 PM in the Black Film Center Archive, IU Main Library, with a presentation by the filmmaker to follow. Sponsors: Black Film Center Archive, Center for Latin American and Caribbean Studies, CUBAmistad, Cultural Studies, Communication and Culture, History Dept, Minority Languages and Cultures Program, and Project on African Expressive Traditions. The director of BFAC who edits Black Camera plans to do an interview with her on the morning of April 13th. Gloria Rolando is best known for films such as Oggun: An Eternal Presence, which explores how the Orisha Oggun, the god of war and peace, metals, and civilization, was experienced in the life of Cuban Yoruba singer Lazaro Ros; My Footsteps in Baragua, a recounting of the history of a West Indian community in Cuba; and Eyes of the Rainbow, a documentary on Assata Shakur, the Black Panther and Black Liberation Army leader who took refuge in Cuba after years of struggles in the United States. She will screen and discuss the first chapter of new work-in-progress, a series titled Breaking the Silence, the first documentary to deal with the 1912 Massacre of over 6,000 members of the AfroCuban party Independents of Color. This first of three chapters is 47 min long and subtitled in English. See www.brownafricanafilmfestival.info and scroll down for info. Public showing of 1912, Breaking the Silence, followed by a discussion with Gloria Rolando, the filmmaker. Minnehaha Ave & East Lake St. below Glaciers Café. 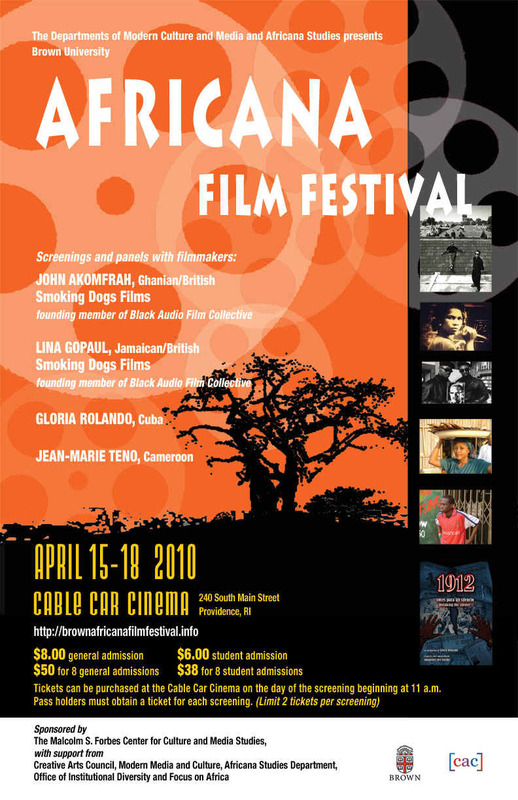 Celebrated Afro-Cuban documentary filmmaker Gloria Rolando will be in Minneapolis/ St Paul from April 23-25th, 2010 to meet with non profit organizations and higher education students and faculty of film and video. During her stay she will screen and speak to audience about her most recent films, Roots of My Heart and 1912: Breaking the Silence. Screenings and receptions will be held on Saturday, April 24th at 10:00 AM at the Resource Center of the Americas, Minnehaha Ave and East Lake Street and a Minnesota Cuba Committee hosted Screening and Reception with food provided by Victor’s 1959 Café and beverage refreshments with live Cuban music at the Marquette Place 35th floor Entertainment Center overlooking downtown Mpls on 1315 Marquette Ave. at 7:00 PM. $15 donation. Rolando is known for her documentary and feature films including Oggun: An Eternal Presence, on the Orisha Oggun, the god of war and peace, metals, and civilization, as experienced in the life of Lazaro Ros, the prominent Cuban Yoruba singer and founding member of the Conjunto Folklorico Nacional; My Footsteps in Baragua, on the history of a West Indian community in Cuba (consisting of people from Jamaica, Barbados, and other Caribbean islands); and Eyes of the Rainbow, a film on Assata Shakur, the Black Panther and Black Liberation Army leader who took refuge in Cuba after years of struggles in the US. She is also a founding member of the film collective, Images of the Caribbean, which is dedicated to developing projects that focus on Afro-descendant communities in Cuba. Rolando's current documentary/research focuses on the massacre of Party of the Independents of Color that took place in 1912 in Cuba. This topic has long been neglected in accounts of Cuban history. Rolando has been working to recover this history through interviews with local communities in various areas of the country, especially Oriente where there are untapped reservoirs of knowledge about 1912, and with historians. This documentary, with three parts, follows her feature film Roots of My Heart, which deals with the theme of a young Afro-Cuban woman's discovery of her ancestors' participation in the events of 1912 and the death of her grandfather in the Massacre. She has completed much of the work on the first installment in the documentary series entitled; 1912: Breaking the Silence. This installment analyzes the creation of the Party of the Independents of Color. During her visit to UNC Rolando will screen Roots of My Heart (feature film, 51 min), and a rough-cut of Part 1 in the documentary series entitled, 1912: Breaking the Silence, which asks why was the Party of the Independents of Color necessary? She will also discuss ongoing development of parts 2 and 3 of the series, which should be completed between May and July 2012 and will coincide with the commemoration of the 100 years since the Massacre of 1912. "Raíces de mi Corazon" ("Roots of my Heart"), an independently produced short feature by Gloria Rolando, is the first filmic treatment of the 1912 massacre of thousands of members of the Independents of Color, the hemisphere's first black political party outside of Haiti. The Independents of Color were largely made up of veterans of the Mambi Army, the Cuban Army of Liberation that defeated the Spanish in two Wars of Liberation (1868-1878 and 1895 - 1898). Recent research in Cuba has established that this army was overwhelmingly Cubans of African descent (80% and perhaps as high as 90%). When the Mambises had all but ejected the Spaniards from Cuba, the resident plantocracy allied themselves with the U.S. to bring about the American intervention known as the Spanish American War in 1898. Evaristo Estenoz founded the Independents of Color in 1908 in order to secure a rightful share for Afro-Cubans in a Cuba which had successfully marginalized them. He was murdered by Cuban troops in 1912 along with over 6,000 other Afro-Cubans, mostly fellow party members, after an intense media campaign carried out by the plantocracy to demonize the party. As famed sonero Arsenio Rodriguez says: "Hay que adorarlos como a Martí!" Historian Aline Helg does an excellent job reporting all of this in her book, Our Rightful Share: The Afro-Cuban Struggle for Equality, 1886-1912, published in 1995 by the University of North Carolina Press. Merecedes, a Cuban woman from Havana, begins to decipher her family secrets through the photo of her great-grandparents, María Victoria y José Julián. Between reality and the world of her dreams, she will learn about the ties this couple -- especially her great-grandfather -- had with the Independents of Color, a political party formed in 1908. The struggle of these black men and women to create a space for themselves in Cuban society at the beginning of the 20th century had a tragic outcome: the massacre of 1912. Many families suffered, but history imposed a silence, the same silence that surrounds Mercedes' great-grandparents. World Renown Afro Cuban filmmaker Gloria Rolando is best known for her films such as Oggun, which explores the Orisha Oggun and “Eyes of the Rainbow” a documentary on the life of former Black Panther Assata Shakur who took exile in Cuba. Her newest film "Breaking the Silence” is the first documentary to present the story of the 1912 massacre of members of the Independent Party of Color. Party of the Independents of Color.